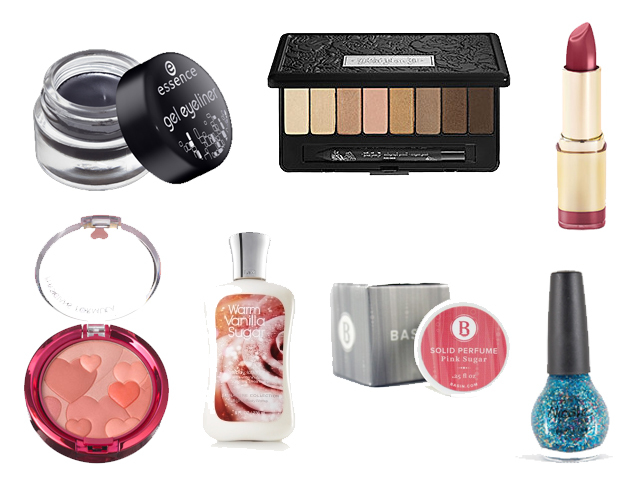 The British Beauty Addict’s American Must-Haves.. | Becky Alyssa's Beauty Box. The British Beauty Addict’s American Must-Haves..
Something tells me I’m going to be broke come October. Oh well! I’ve been ecstatic the last couple of days after finding out my auntie is coming from Orlando to visit me for 6 weeks, and couldn’t be happier. And I’ll get to go back with her and stay for a while before uni starts again! Getting to go out & do fun stuff with my cousins is something I look forward to for months, not to mention the amazing food (queso! vanilla chai soy protein drinks! self-serve frozen yogurt!) . And shopping – I’m always in awe of how good Americans have it in regard to ridiculously affordable & awesome clothing and beauty products, so it’d be a better time than ever to stock up on some wishlist items. Here are some of my favourites that I really need to get my hands on..
1. Essence Gel Eyeliner in ‘Midnight in Paris’ – The European brand Essence has still yet to reach UK shores, what’s up with that? Reviews for this product are nothing short of incredible, & I’m always looking for a good easy-to-use, pigmented black gel eyeliner. And less than $4? I have to try it! And maybe some of the other colours while I’m at it..might as well, right? 2. Kat Von D ‘Saint’ Eyeshadow Palette – Still completely in love with Kat Von D, yet still haven’t got around to trying anything other than her tattoo foundation (which is amazing, by the way). This sleek palette is packed full of gorgeous neutrals which I’m anxious to try. I tend to stick to neutral shadows so I can see this getting a LOT of use, though the coloured palettes are beautiful too – think I’ll find it difficult to restrain myself. 3. Milani lipstick in ‘Plum Rose’ – Haven’t ever tried anything by Milani, but it’s an international brand I keep hearing mentioned on various Youtube channels and blogs. I believe I first saw this used by a Youtuber and loved the pigmentation and deep statement colour. I’m still just getting into lipsticks as I find it difficult to pick shades for my awkward colouring, but $5 isn’t a huge loss if it turns out to look horrible on me. Can’t wait to check out some other Milani products in person. 4. Physician’s Formula Happy Booster Blush in ‘Warm’ – I used to finish up Physician’s Formula green colour correcting powders like nobody’s business and always stock up on them when visiting the US. I haven’t used any of their products for a while but this warm coral-y blush is too cute to resist. And you can never have too many blushes (that’s what I tell myself anyway). 5. Bath & Body Works Lotion in ‘Warm Vanilla Sugar’ – If there was a B&BW in the UK, I’d be constantly broke (especially since prices would probably be doubled). Their lotions and cndles are divine & it’s a shame they’re not stocked over here – I really want to indulge in one of the larger candles which would probably eat up my baggage allowance. Though I’ll be thrilled with one of their delicious lotions in Warm Vanilla Sugar, my favourite scent. And who doesn’t want to smell delicious? 6. Basin Solid Perfume in ‘Pink Sugar’ – Although I only visit Disney if I can get a free ticket from a friend or family member, Disney Village is absolutely free to enter. Much as I love the tacky souvenier stores and overpriced food, Basin is the one place I can’t go home without paying a visit to – half an hour spent here is like heaven for me. If you like Lush stores, you’ll love it here. They’re best known for their cute novelty soaps and body butters and scrubs in a selection of signature flavours. Pink Sugar is my absolute favourite since it smells of sweet, delicious cotton candy. I already own the Pink Sugar body butter but would love a few more items from the set so I smell that good more often. 7. Nicole by OPI nail polish in ‘A Million Sparkles’ – I’m usually wearing sparkly nail polish & this particular shade is gorgeous. Last year I purchased ‘Step To The Beat Of My <3’, one of the Justin Bieber NOPI polishes – as much as I dislike the kid, this turned out to look wonderful on. Can’t wait to purchase more as I don’t believe these are widely available in the UK. Orlando is my favourite place in the world so I can’t wait to visit in a couple of months. My family have lived there since the 1970s but it’s always funny to see so many other British people there so far from home as well! Can’t wait to visit – I’m sure I’ll come back with plenty to post about!